I made this small wedding cake for my manager of the mobile home park where I live. She just married and didn't have a big wedding. I did this cake for her and her immediate family. It is two lemon cakes, baked in a heart shaped pan, a 6 inch pan and a small pyrex bowl. I made all my decors early with fondant to dry a little. Filled the cake with lemon pudding pie filling that I made. Cooled it before filling. I covered all with butter cream and then with white fondant. I did them all separate and then stacked them together and put the flowers and trim on. All is edible. wow! so nice and so cute...thanks nancy for sharing this...u inspired me...God bless!!! Nancy, Nancy, Nancy,I just have one word for you and it is "PERFECT". CUTE AND SIMPLE, LOVE IT! Nancy, you already know how much I love it!!!!!! I love the flowers and ALL of it !!!! Nancy, the cake is beautiful! You are so creative! Hi Nancy, very impressive cake! Well done. 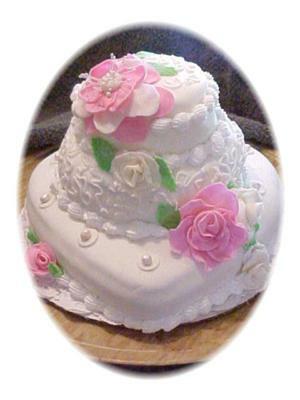 Awesome cake....Love the flowers and your creativity...Hi Nancy, thanks for sharing with me.